Joseph Johnson (’08,’16) started his career at an internet company in Atlanta where he worked his way up to management over five years. His work sparked a passion but not to continue working in the private sector. Instead, Johnson wanted to take his experience and skills in technology and apply it in public schools. After moving to Savannah, Johnson completed a bachelor’s in elementary education from Armstrong State University and taught for seven years at Robert W. Gadsden Elementary School. While teaching, Johnson pursued his master’s degree in instructional technology from Georgia Southern University. Completing his library media certification and master’s degree in 2016, Johnson says he was finally able to achieve his dream. Receiving the position of librarian and instructional technology specialist at Otis J. Brock, III Elementary School, Johnson says he now gets to educate students and teachers on technology and the love of reading. 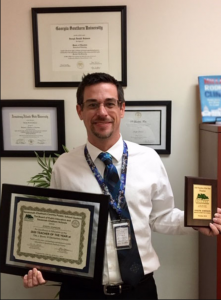 Utilizing the grant writing skills he developed in an instructional technology course during his master’s program, Johnson recently served as the lead on a grant received by Brock Elementary that will put Apple technology in the hands of every second and third grader at the school. Valued at over $700,000, the Technology Tools for Teachers grant was given to only 13 schools in four counties in the state by the Governor’s Office of Student Achievement. Within the Savannah-Chatham County Public School System (SCCPSS), Brock Elementary along with Haven and Hodge Elementary Schools were awarded the grant. While writing the grant, data showed clear learning gaps were present in both math and reading, demonstrating a need for technology integration in a school that is at 98 percent free and reduced lunch and breakfast service. The grant will provide not only Apple technology, but also DreamBox and Lexia software that will assist with math and reading comprehension as well as extensive professional development to support teachers in effectively implementing personalized, blended learning using these tools. Johnson, named 2020 Teacher of the Year at Brock Elementary and one of five finalists for the SCCPSS title, will complete a specialist’s degree in instructional technology in spring 2019 from Georgia Southern, and says he cannot praise Georgia Southern and his education enough for helping him obtain so much success in his education career.